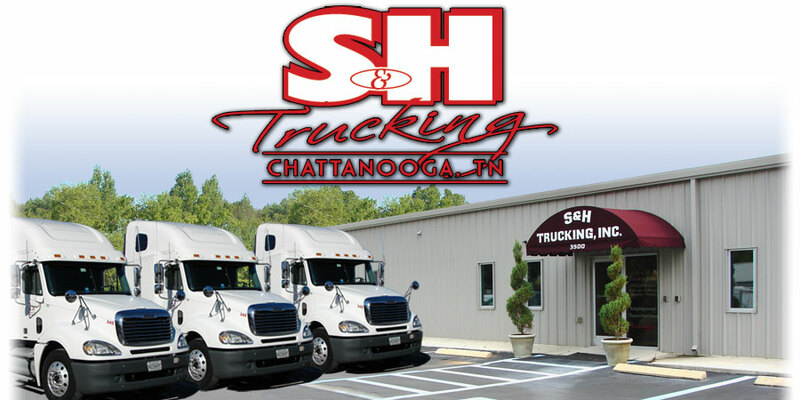 ﻿ S & H Trucking, Inc.
Introduction to S & H Trucking, Inc.
S & H Trucking, Inc., is a freight carrier based in Chattanooga Tennessee. We take pride in being able to provide a broad range of freight carrier services to our customers, while still being small enough to react quickly and with maximum flexibly to meet our customers' needs. We realize that each customer has unique business demands with specific operational requirements. To meet those business demands, our highly trained, seasoned operations staff listens to our customer's needs, and quickly develops an efficient, expedient solution to their requirements. These solutions are tailor made to fit your specific supply chain systems, space, and time management needs. Our state of the art, fully integrated operations system and the new satellite tracking and communication technologies, helps our experienced staff and dedicated drivers provide consistent, reliable, timely handling of your shipments throughout the continental 48 states. S & H currently operates 57 company-owned road tractors and 203 trailers, including dry box, refrigerated, flatbed, drop deck, and pup with lift gate. The entire fleet is constantly upgraded to provide the high quality, consistent performance our customers require and deserve. So when your transportation and logistics needs arise, and you are looking for individualized service, give S & H Trucking a call. We’re here, we’re prepared and we’re ready to help solve your most challenging transportation needs. 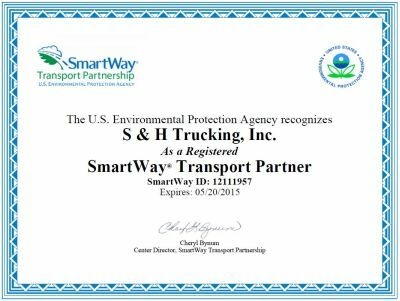 S & H is proud to announce that we are now a SmartWay Transport Partner. S & H Trucking, Inc. is recognized in the industry as an innovative leader in utilizing new technologies to improve service to our customers. Our state of the art, fully integrated operations system is designed to save everyone time. All	your load information is constantly available using our operations system and the new satellite tracking and communication technologies. This helps our experienced staff and dedicated drivers provide consistent, reliable, timely handling of your shipments throughout the continental 48 states..
S & H takes pride in being able to provide a broad range of freight carrier services to our customers, while still being small enough to react quickly and with maximum flexibly to meet our customers' needs. The bottom line: we work hard to make sure of safe, on-time deliveries. S & H Logistics warehouse facilities is built with nearly-indestructible masonry construction. Products are kept safe, dry, and protected year-round. There’s no better way to protect stored products..
Reduce inventory and related carrying costs as product bypasses storage and moves quickly to the end customer. Improve customer service through faster cycle times. Reduce storage and warehouse labor costs. Reduce transportation costs by consolidating into lower cost truckload shipments. Divest assets by leveraging S & H Logistics's infrastructure and resources. Reduce logistics costs through improved processes. Avoid capital investments for facilities and systems. S & H Logistics provides a variety of transportation management services to keep up with our customers' ever changing needs. Customers who use us, can be confident that they will benefit from our extraordinary experience, our top quality attention to detail, and exceptional service -- through every step of the process. Our goal is to complement your in-house transportation capabilities and to ensure the finest service in delivering your products to your customers. We can provide you with seamless delivery solutions and ultimate control over your shipment right to the moment it arrives at it's destination. We keep you informed about your shipments. From pick-up to delivery, we pride ourselves on providing transportation solutions that work. When you need to ship or move ANYTHING - from a computer to furniture to an entire house or business office you'll want to make just one phone call. S & H Logistics is the solution for every shipping concern. We can ship or warehouse anything from one box to full loads. 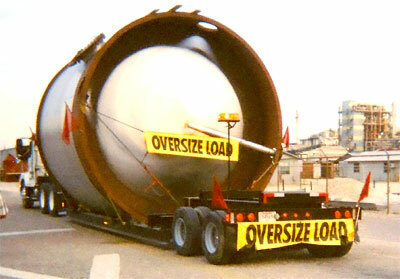 S & H Logistics offers many shipping options and solutions that other transportation companies simply cannot. S & H Logistics can handle your local cartage, warehousing and cross docking needs. Do you hire drivers where I live? This page is being updated. Check back soon. Copyright 2001 - 2016. All Rights Reserved.